Schluter®-RENO-TK profile is designed for protecting tile edges and creating a smooth transition between tile flooring and floor coverings at a lower height. RENO-TK''s 1/4" channel located under the sloped flange of the profile hides and protects the cut edge of the lower adjoining flooring. RENO-T K is available in 5 different heights and 11 different materials/color combinations. 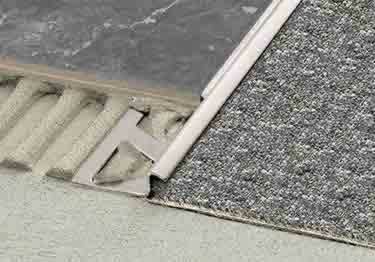 Height: 1/4", 5/16", 3/8", 7/16", 1/2"
installation and existing hall carpet. to be just what I was looking for. The pictures of the variety of styles, different metals and wide range of dimensions gave me confidence in what I was ordering. The product arrived well packaged and in just over two weeks.